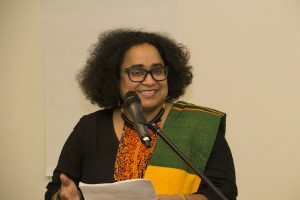 The Centre for Feminist Research (CFR), in co-operation with CFR executive board member and social science Professor Caroline Shenaz Hossein, presented this Black History Month forum celebrating Black economics and the UN Decade of the Year of Persons of African Descent 2015-24. 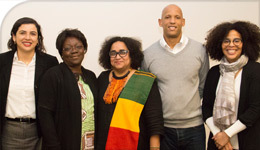 Three scholars were invited to the forum to reframe the narratives surrounding French- and Portuguese-speaking Black peoples and the economy. Gender, sexuality and women’s studies Professor Gertrude Mianda from Glendon Campus spoke first on “Francophone African Immigrant Women in Toronto and Ottawa: The difficult quest for economic integration.” Focusing on Black, French-speaking Canadian women, a “minority within a minority,” who are marginalized by race, gender and language, Mianda found that many, specifically sub-Saharan women, find themselves characterized by low income and precarious occupations in early childhood education and as personal support workers. Outside of Canada, Black women in France are creating their own ways to combat isolation and economic hardship. Africana studies Professor Felix Germain, from the University of Pittsburgh, presented on “Decolonizing the Republic: African and Caribbean Migrants in Postwar Paris (1946-1974).” Germain spoke on the partial illusion France presented to Francophone women from French Guiana, Martinique and Guadeloupe, offering better education and health care but without adequate investment in employment opportunities. As a result, the generations who came after these women have become more entrepreneurial, creating Black-owned businesses catering to the community in ways the mainstream French business economy does not. Political science Professor Simone Bohn rounded off the presentations with “The Quilombolas’ Refuge in Brazil: Social Economy, Communal Space and Shared Identity.” The world’s largest African diaspora population lives in Portuguese-speaking Brazil. Brazil received the largest number of forced workers from Africa during the Atlantic slave trade, says Bohn, and Afro-Brazilians use powerful cooperatives to resist systemic racism and meet their economic and social needs. Quilombolas are those who reside in the economic cooperatives called Quilombos, originally created by runaway slaves who banded together for a communal way of life. Additional speakers at the forum included CFR Director Alison Crosby and Ryerson University Professor Melanie Knight. Crosby, who provided the event’s welcoming remarks, is a professor of gender, sexuality and women’s studies in LA&PS. Knight, who served as discussant and moderated the question-and-answer period, is a professor of sociology. The 2018 Business and Society Forum was co-sponsored by the Social Sciences and Humanities Research Council (SSHRC) Insight Development Grant “African Origins in the social economy: A study on the banker ladies and economic collectives in Canada;” the Office of the Vice-President Research & Innovation at York University; the Business & Society program; the Faculty of Education and the Jean Augustine Education and Community Chair; the Department of French Studies; the Department of Humanities; the Department of Politics; the Department of Social Science; the School of Gender, Sexuality and Women’s Studies; and Gender, Sexuality and Women’s Studies at Glendon College.